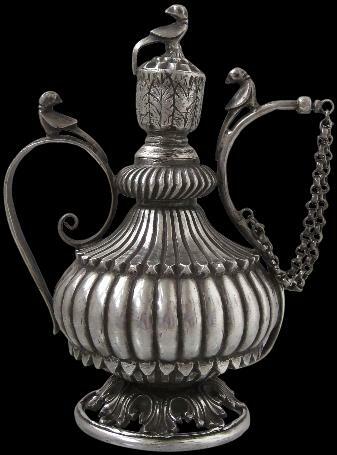 This elegant silver chuski or wine or opium water flask has the classical shape of such flasks occasionally encountered in 18th century Indian miniature paintings of courtly scenes. Such flasks were used to offer guests a small glass of local wine (araq) or opium water. This example has a flared open-work foot decorated with chased leaves; a bulbous, gadrooned body with a lotus-petal shoulder; and a screw-in stopper surmounted by a small solid-cast parrot with another on the thin reed-like spout and another on the handle. The stopper is chased with leaf motifs. The handle is cased with a delicate leaf and flower pattern. A n original, thick double chain attaches the stopper to the rest of the ewer. Opium usage was common in northern India. It was a part of normal social interaction and for some, also an addiction. The Bodleian Library at Oxford, United Kingdom, has in its extensive collection of Mughal miniature paintings one of the dying ‘Inayat Khan, dated 1618. The painting shows the courtier to the Mughal emperor Jahangir, laying on a bed and propped up against cushions. His body is wasted and shrivelled, his face sullen and his eyes blank: the courtier is about to die, a result of opium and alcohol addiction. The Emperor was so appalled and fascinated by ‘Inayat Khan’s extreme condition that he mentions it in his memoirs. two similar silver chuski or flasks are illustrated in Terlinden, C., Mughal Silver Magnificence, Antalga, 1978, pp. 119-20; the ‘Inayat Khan miniature is reproduced in Topsfield, A., Indian Paintings from Oxford Collections, University of Oxford, 1994.